February 19 is Presidents Day this year. Lincoln’s Birthday on February 12th and George Washington’s birthday celebration on February 22nd were rolled into ONE day celebrating ALL the presidents of the United States in 1971. It was done as part of the Uniform Monday Holiday Act. And thus the third Monday in February is designated as Presidents Day. I know it seems confusing, but it appears part of a design to give the workers of our nation some longer weekends. “It’s a good thing,” as the famous Martha, says! And just to confuse the issue further, I have seen the holiday spelled a number of different ways as in President’s Day, Presidents’ Day and Presidents Day. In the first spelling, it infers singular possession, since the original holiday was designated singularly for either George Washington or Abraham Lincoln. The second option of Presidents’ Day is of the opinion that it honors all presidents. And the last option in punctuation opines that Presidents Day is not owned by a single president, but honors all, therefore no apostrophe as it is not possessive. Got it? I shall opt for the third choice here. Alice Provensen has provided parents of picture book readers, and young history enthusiasts, with a classic must read this February 19th or any of the remaining days of the year!! Rigged the Sale of the Century. Each man is a tale waiting to be told, with each two-liner poem presenting each president’s numbered place AND a fact identified with him! Our best beloved President ONE. Well, Six is Adams’ son, John Q.
Lincoln was a union man. In a troubled world he kept his cool. Veered left and right and back with ease. Cultivated hope in time of war. Ms. Provensen provides a fact-packed “Notes About the Presidents” at the end of her picture book, with an additional bibliography for you and your young reader to use as in-depth resource. I learned which president never attended school, who had fifteen kiddies and who was the first unelected man to hold the highest office in the land. 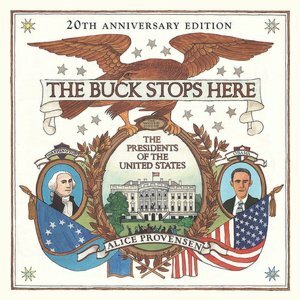 Enjoy this perfectly presidential read called The Buck Stops Here. Harry S. Truman had a sign with that particular saying on it at the front of his desk. Guess he felt the phrase, “Passing the buck”, that means attributing responsibility for your actions to someone ELSE, stopped with HIM. I’m just wild about Harry! !